They say it's the thought that counts, but it doesn't hurt if the gift is also good. Our experts have put together a charming basket sure to please. 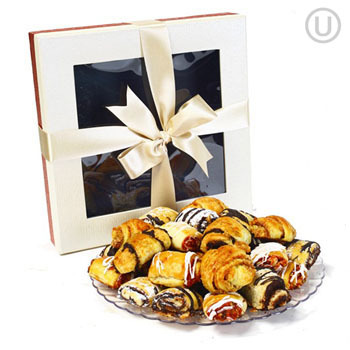 Your recipient will enjoy the fruits of your labor as they snack on delicious Rugelach, with Chocolate, Cinnamon, Vanilla, and more (net weight 1.5lbs). Say Happy Birthday, send your best wishes, or sneak a treat for yourself with Handpicked Gourmet. All products are certified OU Kosher- Pareve-Pas Yisroel.